The capital city of Spain is the centrally located hub of the country in many respects … except for dark tourism. There is very little of specifically dark interest here and what there is is mostly not very well commodified for tourism (except in the form of specialist guided tours), but there's enough to justify an entry here. What there is to see: For the dark tourist there isn't much in terms of dark sites specifically commodified for tourism, but you can go on Spanish-Civil-War-themed tours here too. Unfortunately I didn't have the time to arrange one for my brief stopover in Madrid on my recent Spain trip. But if these tours are anywhere near as good as the equivalent one I did in Barcelona, then they're bound to be very well worth it too (and the reviews you can find online certainly confirm this as well). In Madrid these Civil-War Tours are run by Dr. David Mathieson, a British historian, who also offers tours into the surrounding land and former battlefields (see spanishsites.org and details below). These tours are far and wide the only proper commodification of this historical dark topic within the Madrid area and the city itself. Other than that it is more or less completely swept under the rug by the official tourism industry here. There are a few locations related to those darkest days of Spain's history that you can go and see for yourself, but without a guide these will remain silent and at best symbolic. One such place is the monument by the steps that lead up to the location of the Debod temple a bit west of Plaza de España and north of the Royal Palace. It's a semi-abstract depiction of a dead body fixed onto a wall that looks like symbolic sandbags. But there is no information as to what exactly it stands for. Another anonymous site which played a part in Spain's dictatorship history during the Franco regime is the building on the south side of the Plaza de la Puerta del Sol (on which you can also find that cute bear & tree statue that serves as a symbol of Madrid). The building used to be the Ministry of the Interior (now it houses city government offices) and in the basement were cells for political prisoners (who may possibly have been tortured there as well). Nothing of this dark history is mentioned here either. However, there is a memorial plaque on the wall dedicated to the victims of the terrorist attacks of 11 March 2004 and all those who helped in the rescue efforts. This terrorist event, in which a total of ten bombs were detonated in a co-ordinated attack targeting commuter trains, claimed 191 lives and injured ca. 1800. It remains the worst ever act of terror committed on Spanish soil … and was the worst in Europe since the Lockerbie bombing of 1988, and worldwide since 9/11. An Islamist extremist cell associated with al-Qaida is generally believed to have been behind the attacks. Within Spain the Madrid bombings have become known as 11-M. The main site of the attacks were trains inside or approaching Atocha Station located in the south-eastern corner of the inner city centre. At the station today you can find a memorial to the 11-M bombings. It consists of a tall glass brick cylinder inside of which reproduced messages of condolences are inscribed on a transparent membrane, visible and illuminated from a chamber underneath. The location of the monument makes it easy to miss it in daylight if you don't know where exactly to look: it is not located in the forecourt or inside the old station building (otherwise itself a tourist attraction – basically it's been turned into a huge greenhouse) – but it stands to the north-east of the main side entrance to the new station at the intersection of Paseo de la Infanta Isabel and Calle de Alfonso XII. Finally, one of Madrid's art museums also has a special item of particular interest from a dark-tourism perspective: the original of the world-famous Pablo Picasso painting “Guernica” (see Gernika!) is now on display at the Reina Sofia National Museum of Modern Art (Museo Nacional Centro de Arte Reina Sofia – open Mondays and Wednesdays to Saturdays 10 a.m. to 9 p.m., more restricted opening times apply on Sundays; admission: 8 EUR, free many evenings and on some special days). Location: right in the very geographical centre of Spain – ca. 300 miles (500 km) west of Barcelona, 250 miles (400 km) north of Seville and 200 miles (350 km) south of Bilbao (see Gernika). Access and costs: easy to get to, inexpensive compared to other European capital cities. Details: Getting to Madrid is easy by air or rail (or car, though driving in the city can be stressy and should be avoided). Many airlines connect to virtually everywhere in (Western) Europe and beyond. From within the country, especially from the east (Zaragoza, Barcelona) and south (Seville, Malaga), Spain's excellent high-speed rail system makes internal flights totally unnecessary. North-bound the system is slightly less efficient and fast but it is still possible to do a great number of internal journeys by rail. Check the website of the national rail operator Renfe for timetables and fares (renfe.com/EN/viajeros). Getting around within Madrid is possible on foot if you only stay in the central old town centre, but going or coming from further away you may have to use the metro, which, however, provides excellent connections to almost everywhere. It is one of the most modern and most extensive metro systems in the world (currently operating a whopping 13 lines!). The Spanish Civil War tours in Madrid (and beyond) are run by Dr. David Mathieson and have to be arranged (well) in advance: email spanishsites(at)ymail.com for more info. The prices for the tours start at ca. 45 EUR per person in a small group, for a 3-hour walking tour just in Madrid. Arrangements for tours (by car or minibus) to the surrounding battlefield sites obviously cost a little more (but are still reasonable). Accommodation can be a bargain in Madrid, as there is a wide range including plenty of budget options and even grander hotels often offer very good weekend or off-peak season rates if you book in advance. Food & drink can be similarly affordable, especially if you make do with one of the countless traditional tapas places or ethnic restaurants. Simple (but quite agreeable) local wine can be astoundingly cheap. Time required: For just the dark-tourism aspects, a single (even only half) day can be enough, but if you also want to see some of the non-dark things, or go on excursions outside the city limits, a couple of extra days can easily be filled too. Combinations with other dark destinations: One of Spain's major – albeit highly controversial – dark-tourism destinations in only a short distance away to the north-west: Valle de los Caidos, Franco's gigantic monument to the “fallen” of the Spanish Civil War and also the place where the old dictator was entombed himself after his belated death in 1975. A stopover at this site is often combined with day return excursions to the Escorial Palace. It can also be part of those special Civil-War-themed tours mentioned above. To get there independently, however, you need your own means of transport. For other sites further afield see under Spain in general. Combinations with non-dark destinations: The city has plenty of museums, parks, palaces and other grand architecture to keep a mainstream tourist entertained for days, but somehow it doesn't quite match the appeal of other major Spanish cities such as classy Barcelona or grand and Moorish-influenced Seville. 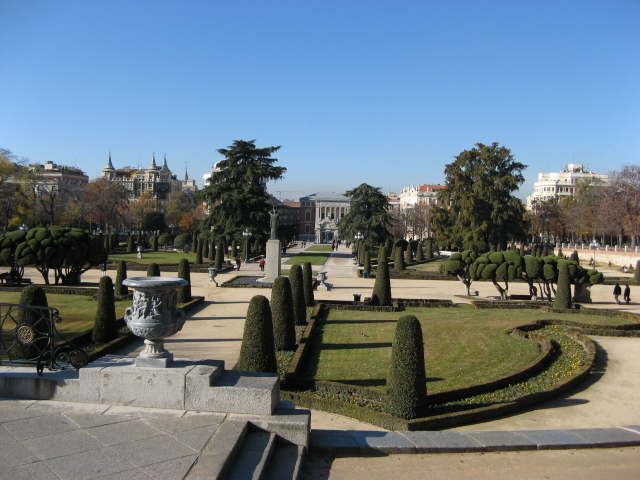 Yet Madrid is home to some of the world's foremost art museums, in particular the Prado. Furthermore it is home to the old Palacio Real (Royal Palace), one of the most imposing buildings of its type anywhere. And speaking of Real: also based in the city is one of the most successful and legendary football teams in history, Real Madrid – so celebrated that they even have their own museum. But this is not the place to list all the city's attractions – there are plenty of other online resources available that can do this much better. See also under Spain in gerneral.